Tie a room together effortlessly with the perfect rug. We’ve all fallen in love with the open plan home, be it a modern condo, artsy loft or traditional house. Gone are the days when the cook was isolated in the kitchen, cut off from all the conversation. But with the absence of walls, comes the challenge of defining space: how do you create zones for work and play, socializing and dining without so many room divisions? a graphic pattern for added pop. 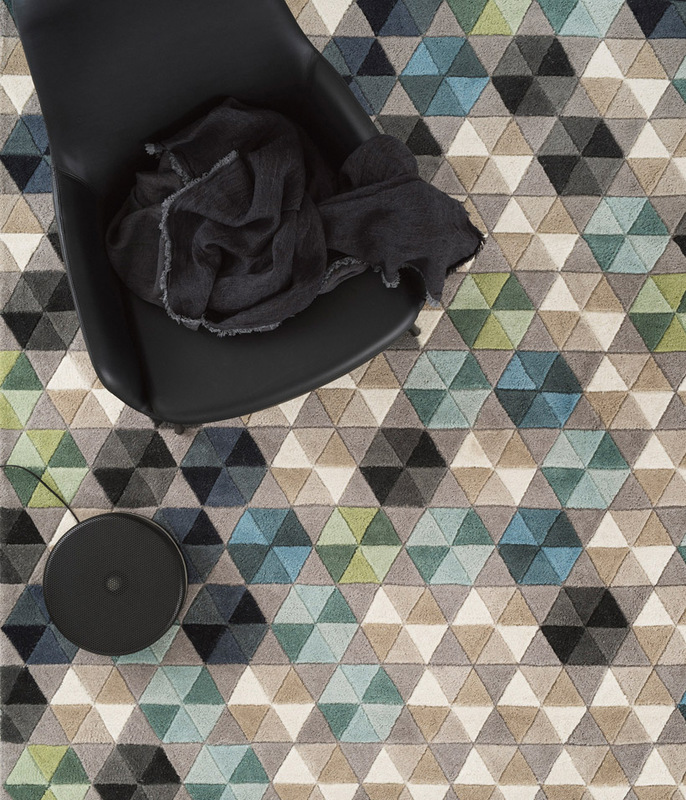 Rugs define spaces, accent areas, and can even delineate functions. A sisal rug or colorful pieces of modular carpet can indicate boundaries for kids at play. A beautiful area rug can pull an intimate conversation area together, adding dimension and interest. And a runner can create a hallway, as well as protect a gleaming wood floor. Whether you have hardwood, concrete, tile floors, or even wall-to-wall carpeting, area rugs can soften the impact of your footsteps, as well as working as an integral design element. Patterned rugs can inspire a new color scheme, or compliment an existing one, and a solid color rug can ground a grouping of patterned furniture and add impact. Having two area rugs exactly the same size and dimensions in adjoining areas actually makes the space look smaller. Choose different sizes or dimensions, such as one square rug, and the other a rectangular shape. For an effortlessly inviting look, and to keep your guests from falling off the edge of their seats, make sure the rugs for your dining and seating areas are the right size. For an accent rug in the dining room, pull all the chairs away from the table as though you were finishing your meal. The rug should be large enough to keep all the legs of your chairs within the carpeted area. For living rooms, it looks best if the couch and all the chairs have all their legs within the area of the rug, with a few inches to spare on all sides. For high-traffic areas, make sure you choose a rug made of a durable, easily maintained material. Wool is actually easier to clean than silk or viscose. And sisal rugs, while inexpensive and practical for some more casual areas, do wear out more quickly. Whether you’re adding a rug to an already furnished room, or starting from the ground up, rugs can create impact, pull a room together, and inspire a color scheme you might not have otherwise considered.